The largest ship ever built at Volkswerft Stralsund, the Olga Maersk is seen here photographed shortly after completion. I embarked this ship January 10 2004, and sailed with it until April 14 as a dual cadet, working both on deck, bridge and in engine room. 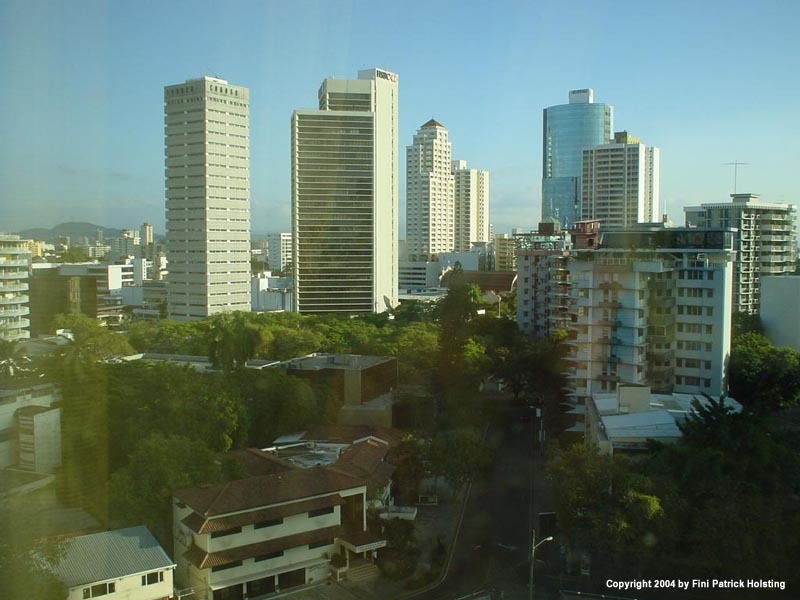 The view from my 10th floor hotel suite in Panama City, where I stayed one night. 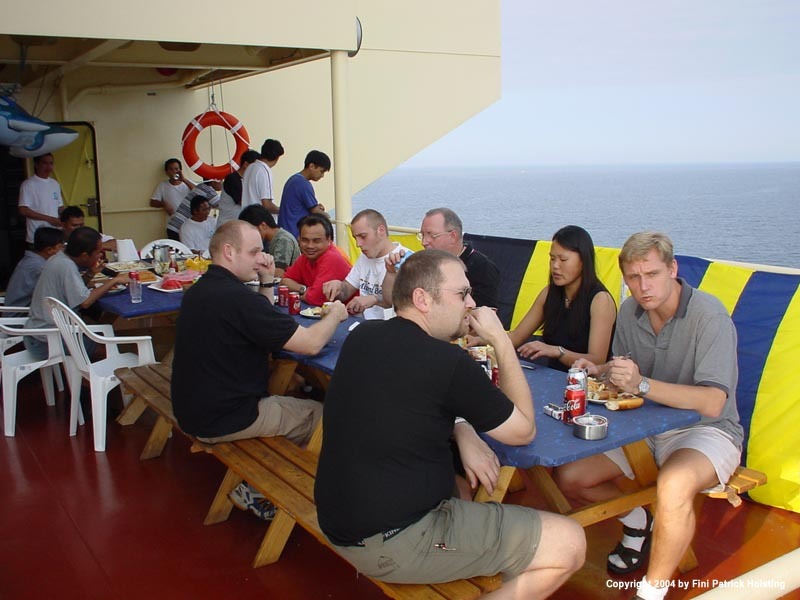 I joined the ship in Panama, and arrived one day before the ship. I arrived late night, so unfortunately didn't have time to see the city this time. Luckily I came back several times. 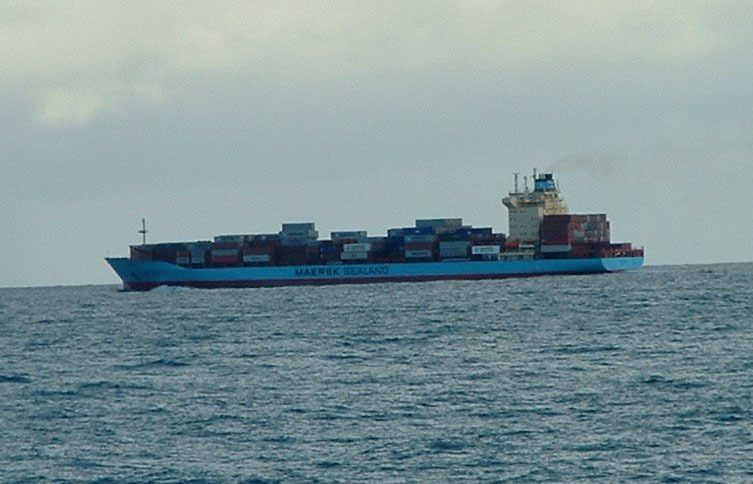 The Olga Maersk was berthed in Balboa, half an hour from Panama City. 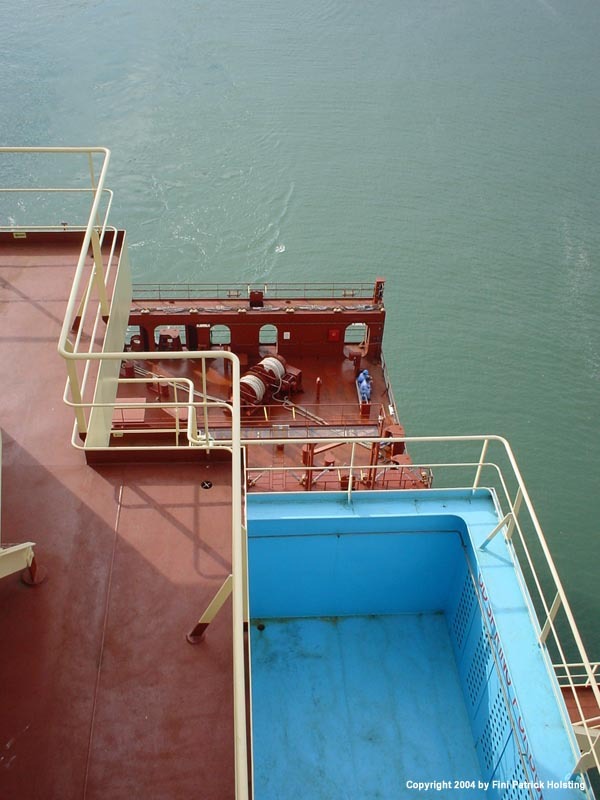 Shortly after embarking the ship, I took a look around, and found we were bunkering (receiving fuel oil) from this barge on our starboard side. When I joined the ship in Balboa, she came from San Antonio in Chile. Since the ship was going back to Chile again, the ship was emptied completely in Balboa. We were therefore berthed for around 20 hours, which is a long time for a container ship. 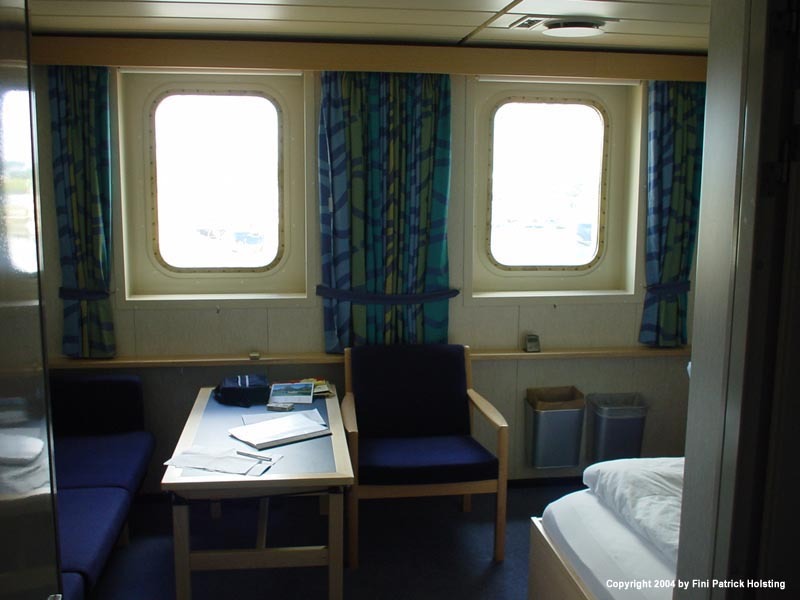 My cabin on D-deck port side. I always had a good view over the ocean since the windows are on the side of the accomodation, and the view cannot be blocked by containers. Another view of my cabin. 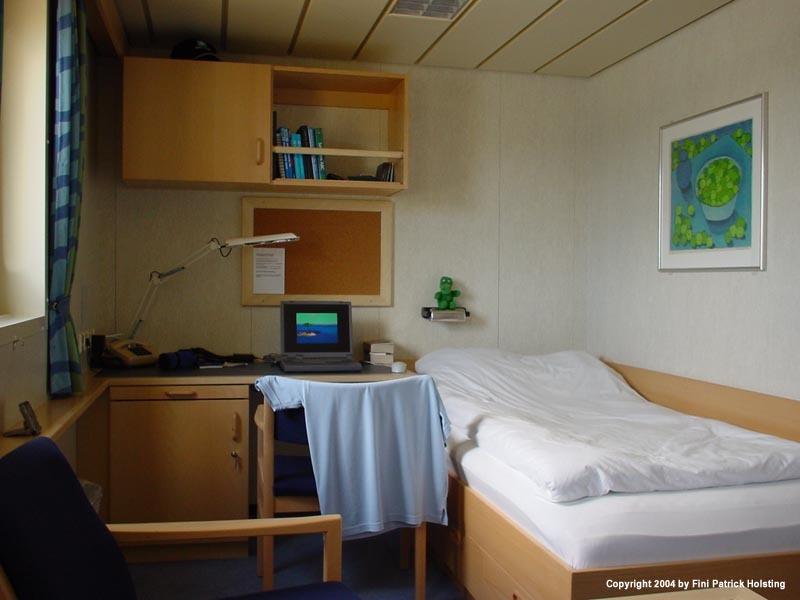 There is often art on the walls, which makes the cabins cozy, and the desk features a refridgerator, allowing for a small stock of soft drinks which are free on board. 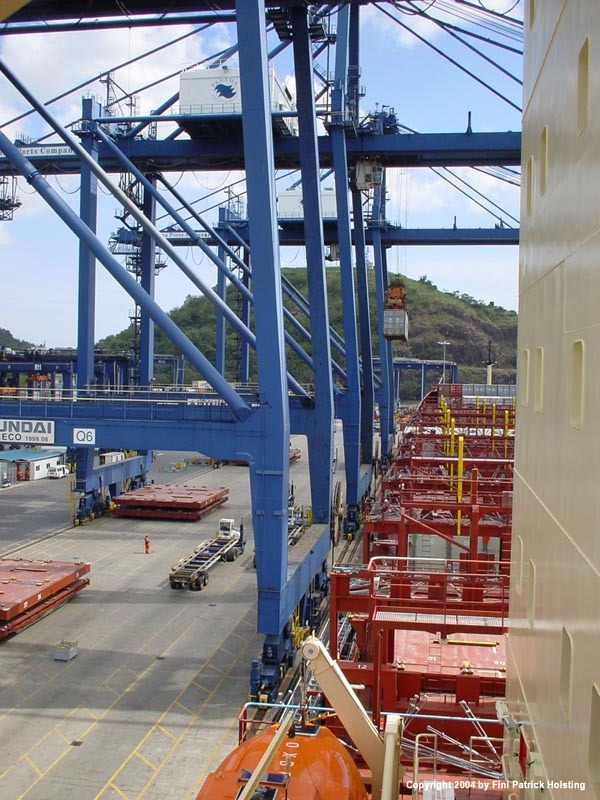 A look at the deck cargo just in front of the accomodation reveals the biggest income of this rute, the reefer containers. Each of these containers are equipped with a refridgeration plant, and when connected to the ships electrical system, they can maintain temperatures as low as -20 degrees Fahrenheit, some even lower. 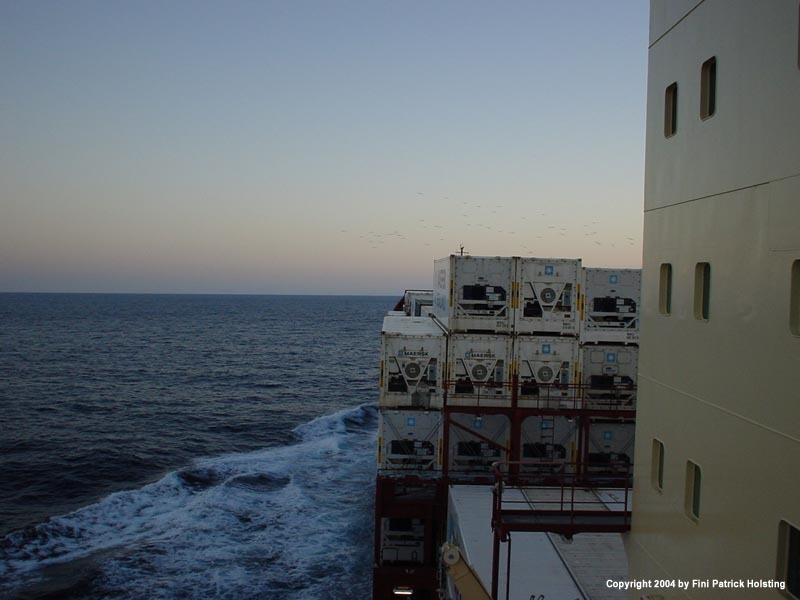 On one specific trip from San Antonio we carried 800 running reefer containers, the maximum for the ship. 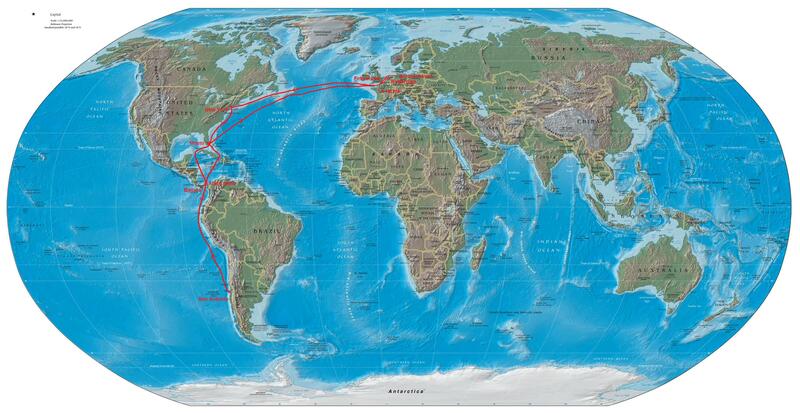 After joining the ship, we went to San Antonio, Chile, and then back to Balboa, Panama. 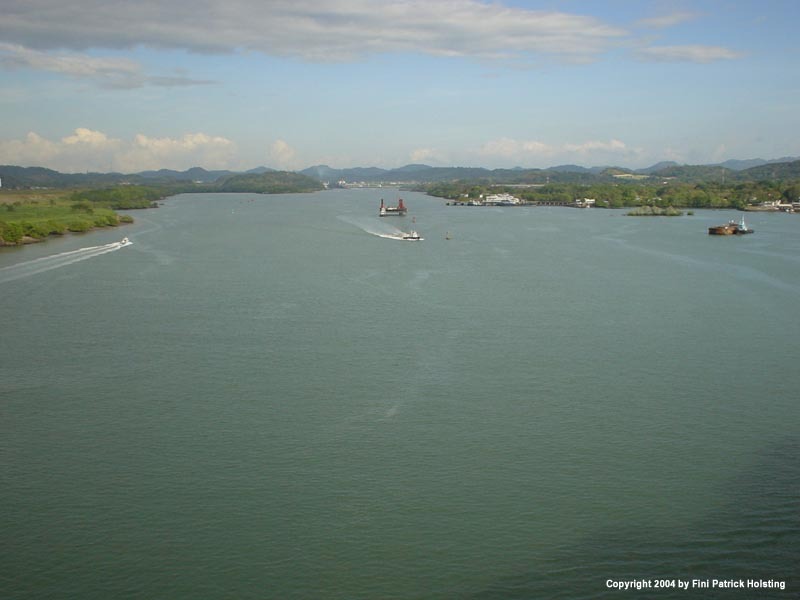 This picture is taken just outside the entrance to the port and the Panama Canal. 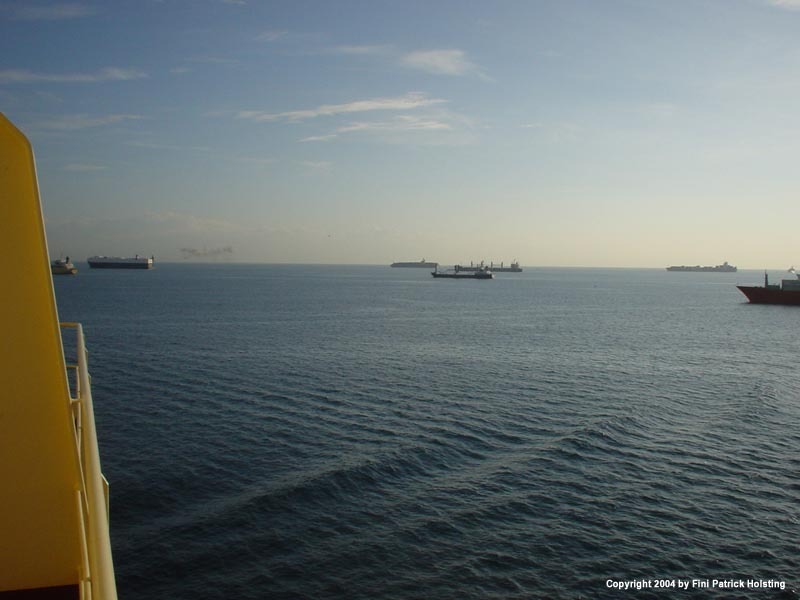 This time, we jumped the entire que, since these ships are waiting to pass the Panama Canal, while we were just bound for the port of Balboa. After Balboa we headed south for San Antonio again. 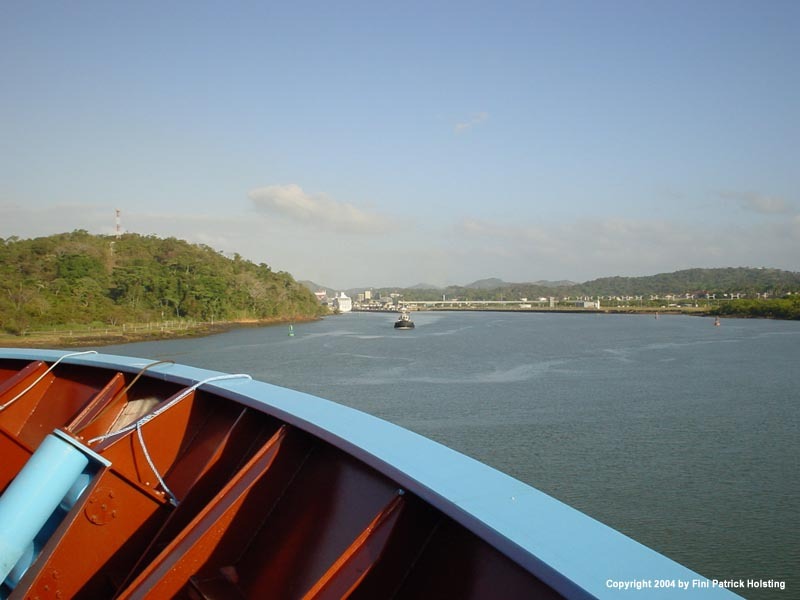 14 days later we returned, and this time we were also going through the Panama Canal. Also from the entrance to Balboa and the Panama Canal, taken a few minutes later. In the background the mountains that surround the port of Balboa, and to the right the "Flamenco Island", a place with bars, discoteques, shopping malls, restaurants and shops. A nice place, which I visited the same night along with some of my fellow crew members. A look forward from Monkey Island (top of accomodation) as we draw nearer to the port of Balboa. Luckily, the bridge up ahead was so high that we didn't have to lower any antennas. By the way, nearly all the containers here on deck are reefers. Looking past the pool down on the poop deck (aft ship) from Monkey Island. 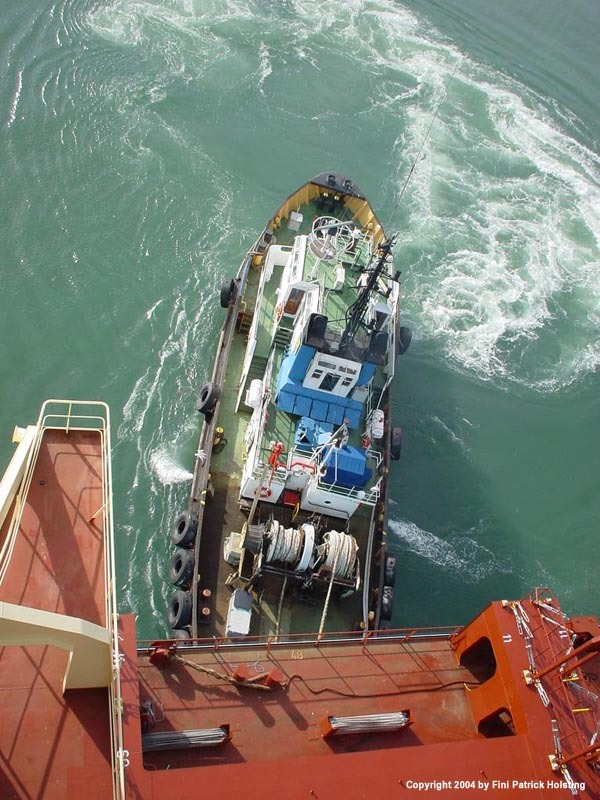 Two able seamen can be seen, waiting for the ship to draw close enough to the peer to start mooring operations. 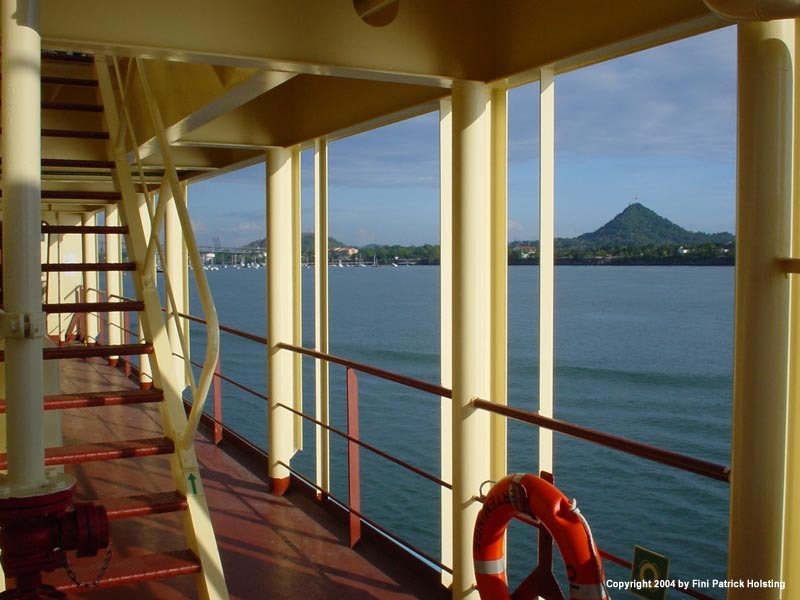 Just after passing the bridge we turned starboard, and here we are looking to port side, down the entrance to the Panama Canal. A mile further in this direction the first locks are, the Miraflores Locks. 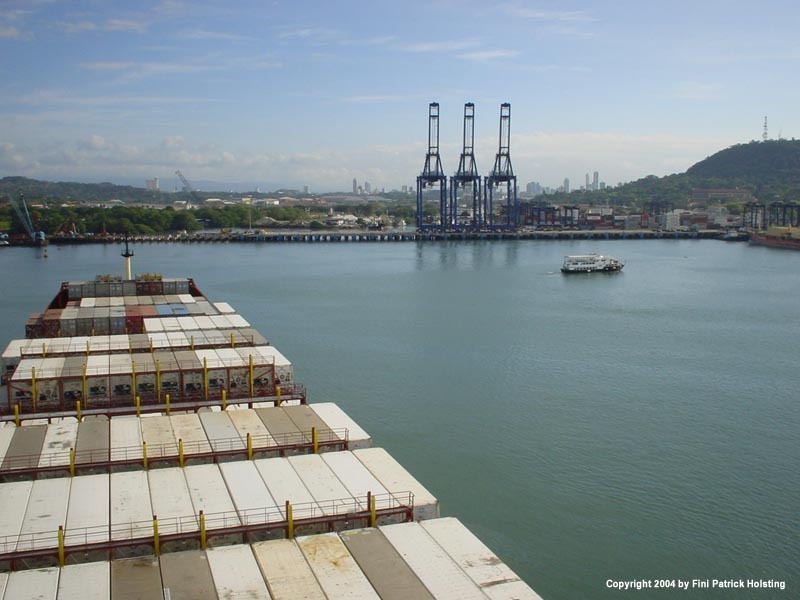 This picture taken just after the previous one, showing how near the port is to the Panama Canal. We turned all the way starboard, and had port side along side. One of the two tugs helping us turn. 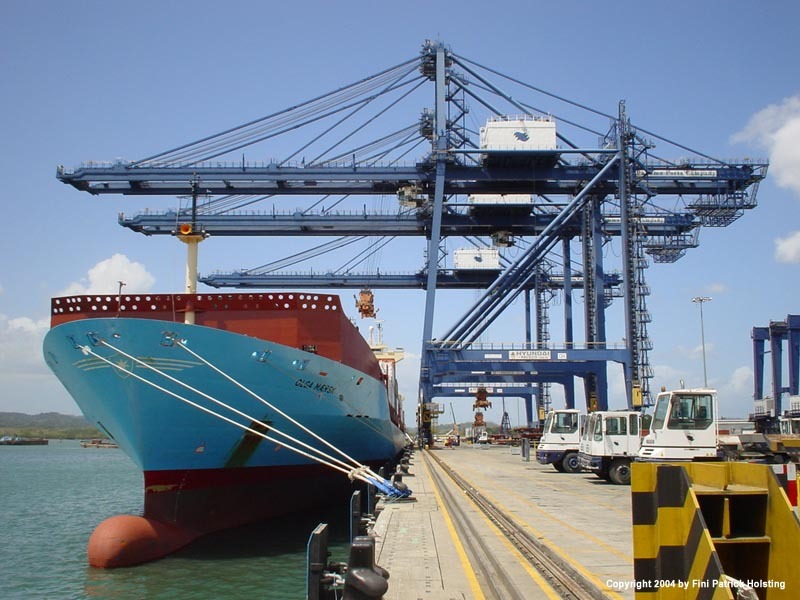 Olga Maersk has thrusters, one forward and one aft, each developing 16 tons of force, but the tugs are handy in speeding up the turning process. 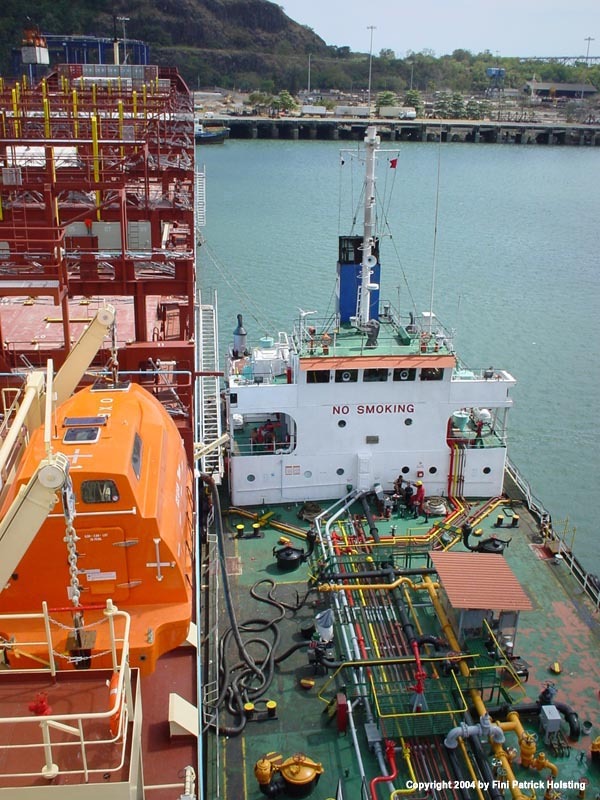 Some ports demand the use of tug boats when entering or leaving. After Balboa we headed south again, and on the way back north from San Antonio we had a table tennis tournament, spanning over a week. It was very popular and brought the crew together. The matches were often watched by an enthusiastic crowd, as shown here. A common scenario in the duty mess during one of the day's breaks. I'm the one looking over my shoulder at the left table. On the way north from San Antonio we also had a grill party, and everyone did just a little bit extra to make a nice evening. 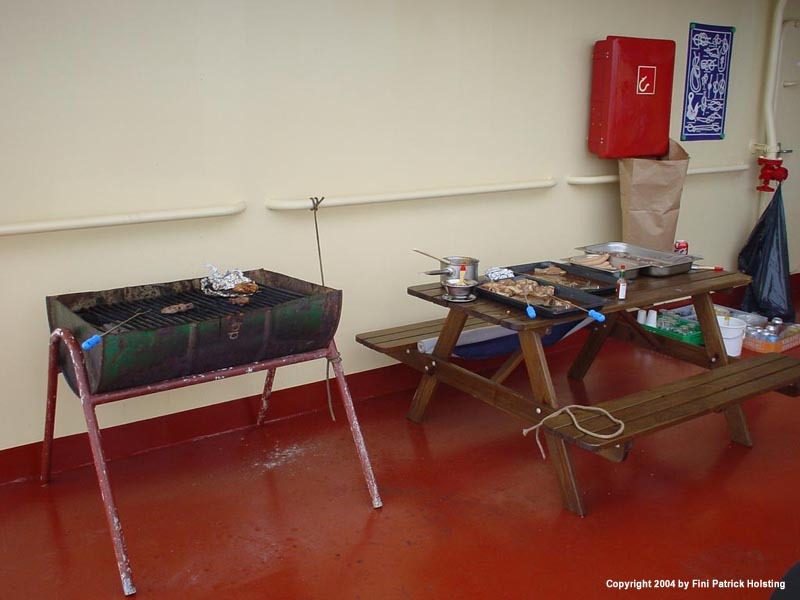 The place was decorated, the grill started at 1700 and worked stopped in time fore everyone to be there, exept the chief officer, who is on bridge watch. 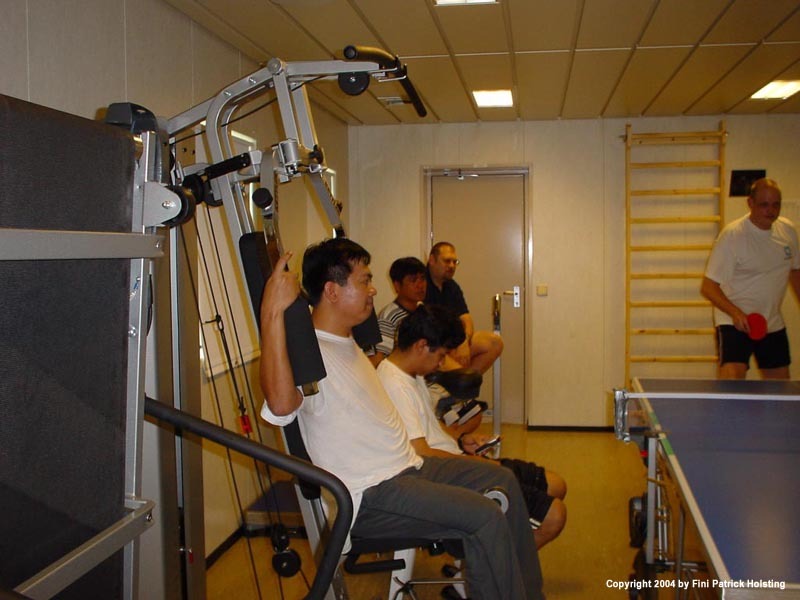 The Captain later relieved him, so he could also get a share of the fun. 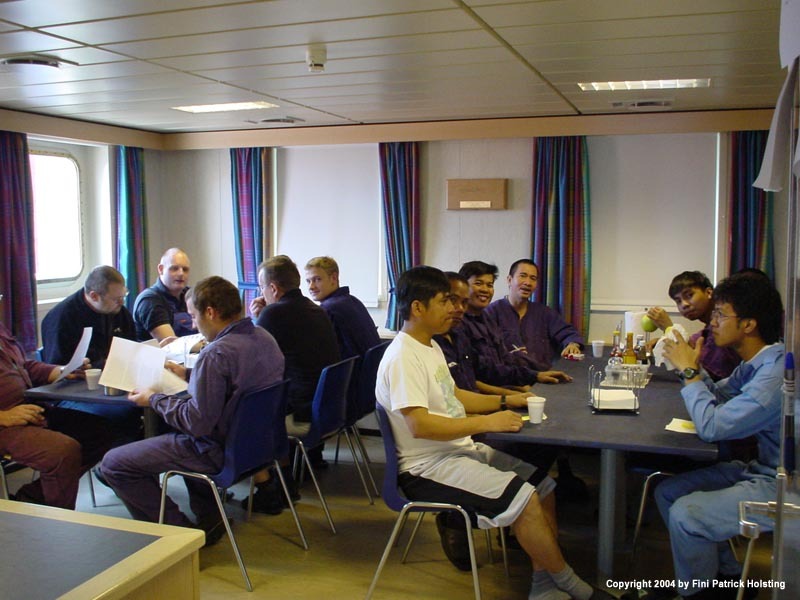 The party brought everyone together; Navigators, engineers, able seamen, painters and steward and cook. The party didn't last as long as it did when alcohol was allowed on board, but it was still very nice and much fun. Our grill, a 200 liter barrel cut in half. Very effective, and with room for everyone's food! My fellow cadet Katrine shot this picture of me watching over my steak. Standing near to the grill almost got you fried, it was very warm! The sun on its way down late evening. 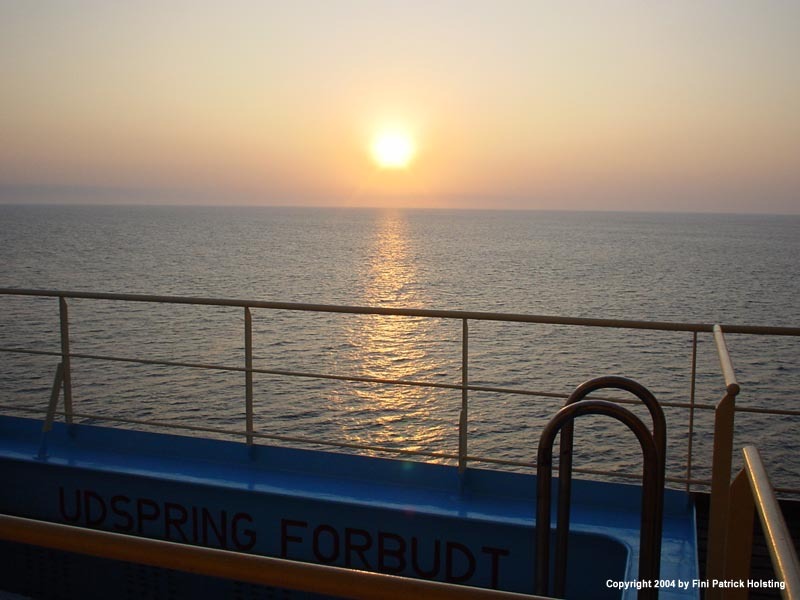 Very beautiful, and a frequent sight at sea. 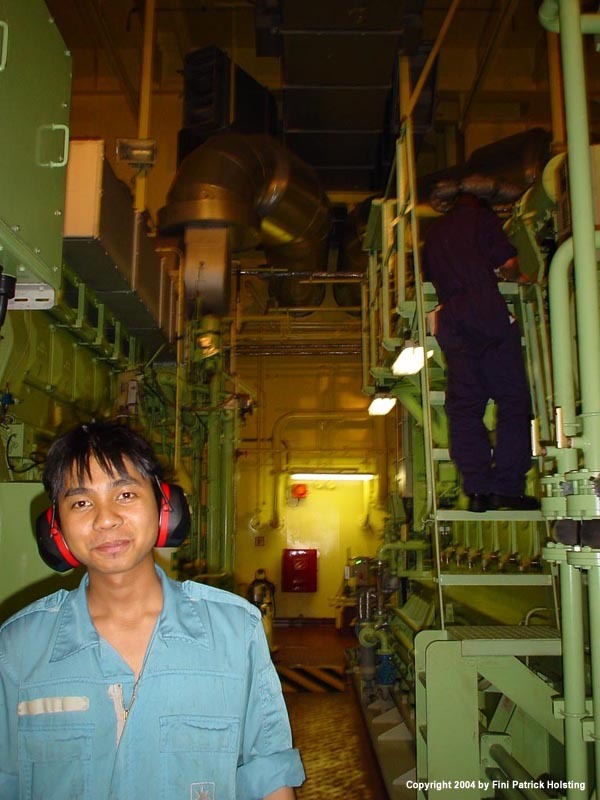 Business as usual, 3rd Engineer Hermes instructs me in doing a so called speed test on an auxiliary engine (has a generator attached, and produces power for the ship and reefer containers). There are four of these generators on board, each developing 2700 kW of power (440V AC 3ph, 60 Hz). During a speed test the engine is run at a certain load, and different values such as exhaust gas temperature, lube oil pressure, fuel oil temperature and many other readings are written down. These values are helpfull when determinating the performance of the auxiliary engine, and might indicate when maintenance is needed. 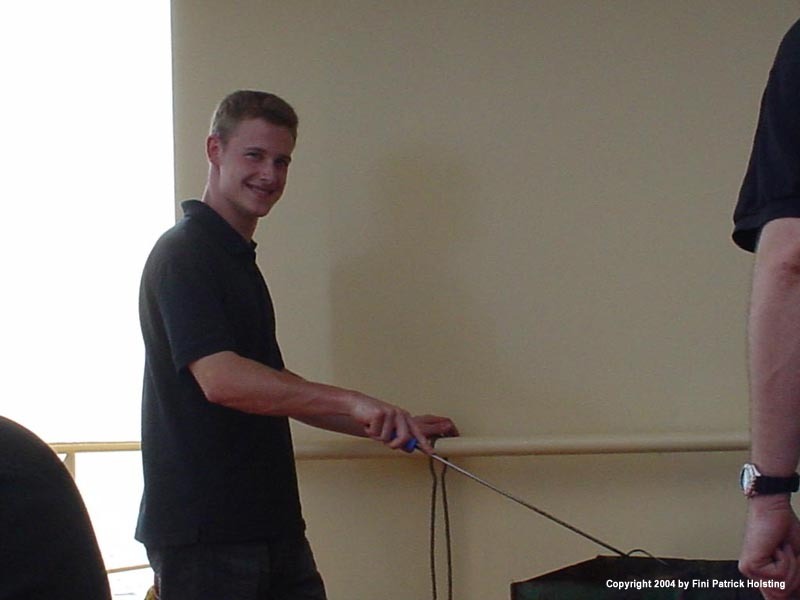 Here I'm operating the control panel on auxiliary engine no. 2, reading the nescessary values for the speed test. The engines are of MAN B&W Holeby make with Hyundai generators. Back in Balboa, I took this picture of Olga Maersk as loading and unloading was taking place. Three cranes were working on the ship, so we only stayed half a day before passing through the Panama Canal on our way to the Caribbean Sea and Manzanillo, Panama. I had a few hours off around noon, and went to a small duty-free shop on the peer with some of the other crew members. From left to right, repairman Bogdan (Polish), painter Sanan (Thai), cadet Katrine (Danish) and repairman Witold, Bogdan's father. 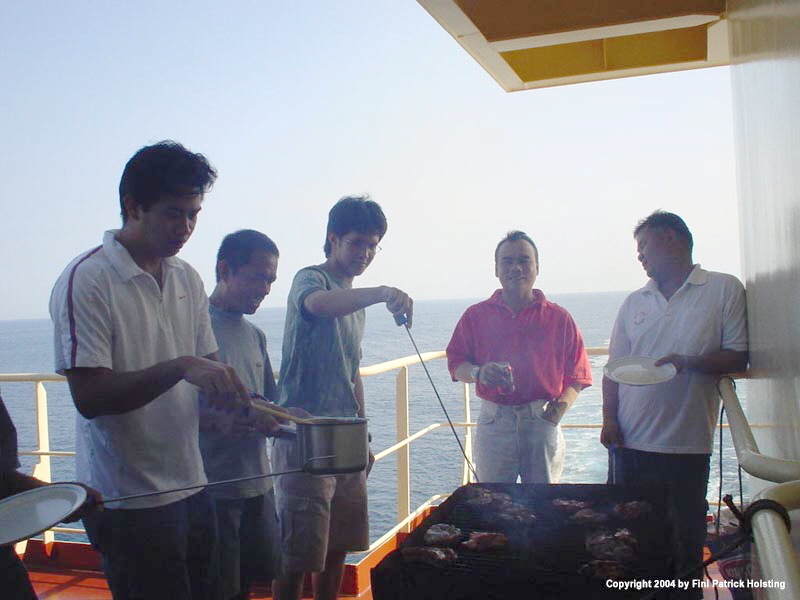 All great guys, whom I often went ashore with. 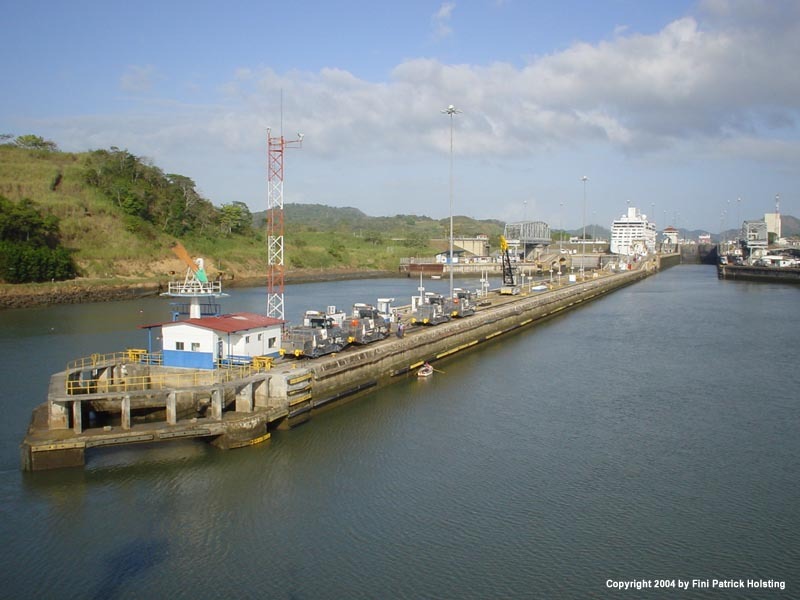 After waiting over night at anchor outside Balboa, around 0700 next morning we headed to the Panama Canal. This picture was taken when passing the port of Balboa. 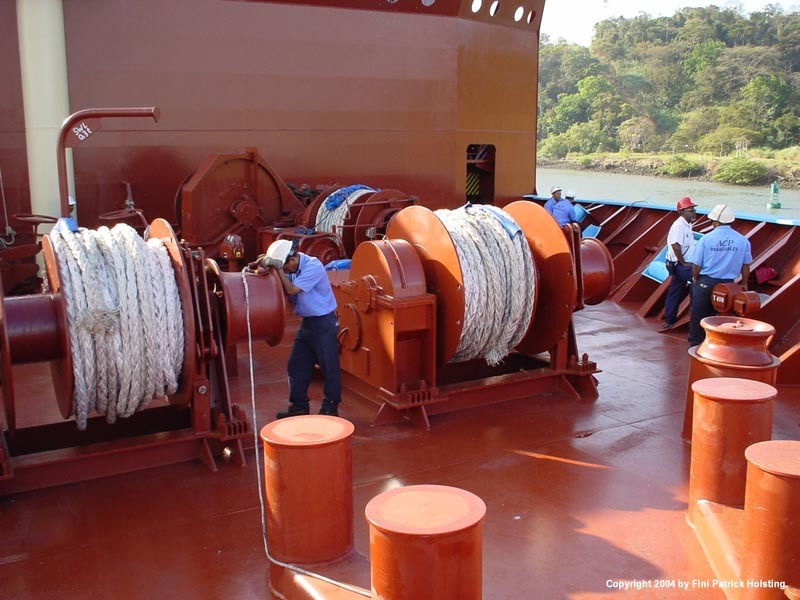 20 people, the so called Panama Crew, join the ship and take care of all wire and rope handling. 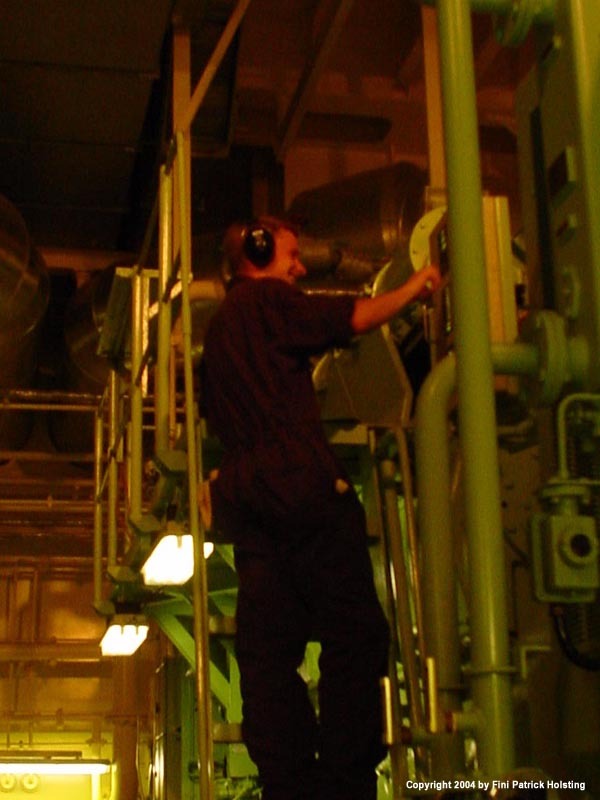 The ship's officers, and in this case also I, run the ship's winches and maintain communication with the bridge. 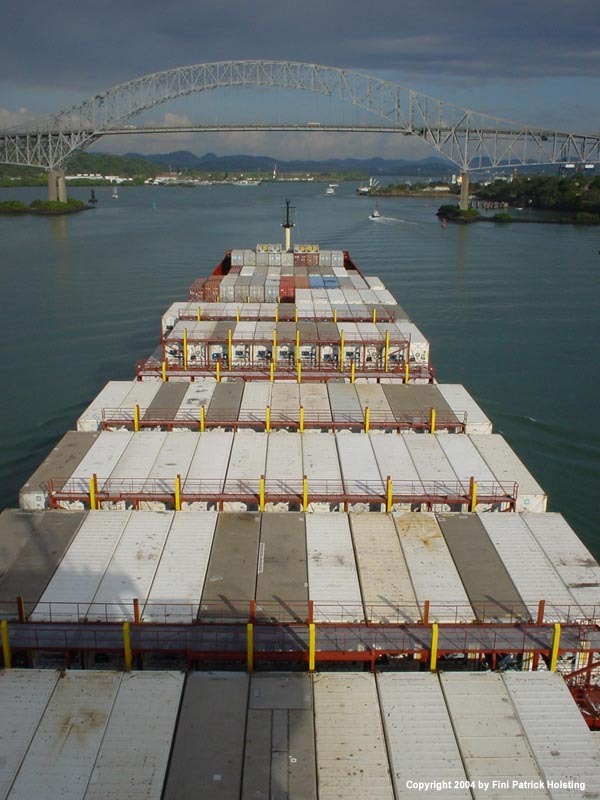 Passing through the Panama Canal involves a lot of waiting, as seen here. 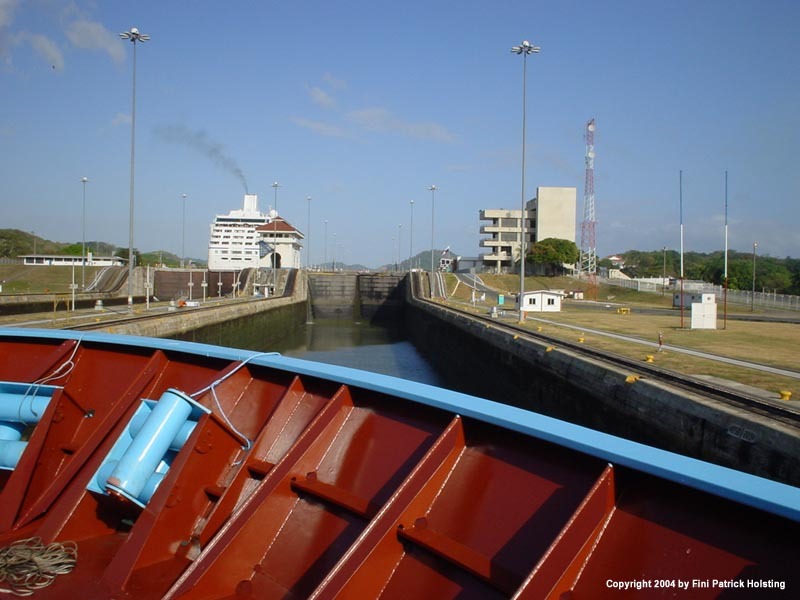 Reaching the first lock on the Pacific side (the Miraflores Locks), the Panama Crew pulled on board wires from the locomotives, enabling them to guide the ship and keep it in the middle of the canal. The forward motion of the ship is carried out by the ship itself. A little further inside the same locks. Even though it is very narrow, the locomotives are very successfull in preventing the ship from scraping along the sides.